Relax to the waves in this 5 bedroom, 4 bath beach cottage with great ocean views. Enjoy your morning coffee on the deck with the smooth waves crashing. 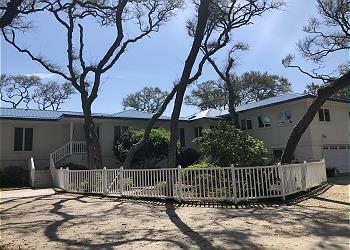 Oceanfront 5 Bed, 4 Bath, Great Room, Kitchen with gas grill, Dining area, Screened Porch & Sundeck w/fabulous ocean views. MW, DW, W/D, 4 Cable TV, 1 DVD, WiFi, Charcoal Grill. . BEDS: 2 King, 2 Queen, 1 Full, 5 Single. Sleeps 15. NO PETS, NO SMOKING.